How to show words by a simple key press in cyan, green, yellow and other colors, with a Freeware tool for Windows and Linux/Mac. In the mode menu at the right bottom, activate "alt over". over a word will highlight this word in all views. This feature is also available in Depeche View Lite. Linux users may have to enable the Alt key first. You are surfing over text and want, for example, all "Chapter"
-  point the mouse cursor at the word "Chapter". WITHOUT moving the mouse, all within a second. 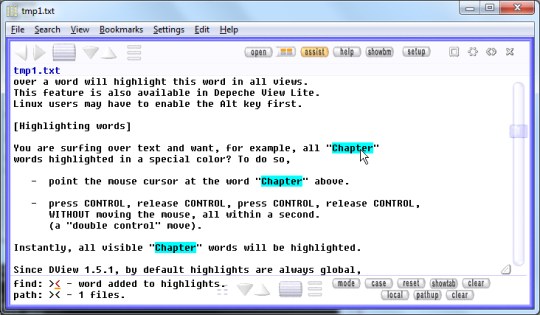 Instantly, all visible "Chapter" words will be highlighted. easy comparison of all text. it globally, and colors are not necessarily synced. Repeat the above move on the same word to switch off the highlight. To reset all highlights of all words, use Double Control on BLANK space. how can this be done? 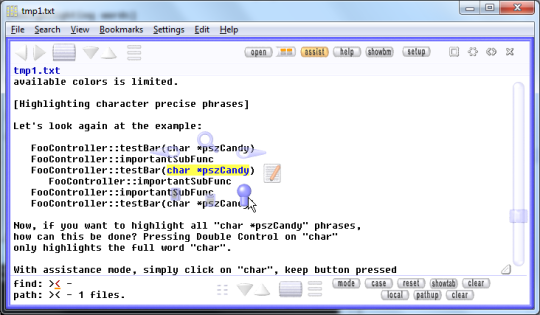 Pressing Double Control on "char"
only highlights the full word "char". and move the mouse to "pszCandy". Then select "highlight phrase"
-  move the mouse cursor onto "c" of "char" and concentrate. and do this all WITHIN ONE SECOND. the "c" should be highlighted. if it doesn't, you were too slow. -  move the mouse slowly over to "y" of "Candy". don't panic, you have endless time now. -  when done, RELEASE the mouse button. -  then RELEASE the CONTROL key. If you mark "foobar" for highlight, will "FooBar" also be highlighted? which toggles highlight case sensitivity independent from searching.